The Sign Design Guide was published jointly by the SDS and the Royal National Institute of Blind People (RNIB). Written by Peter Barker OBE, BSc (Eng), a member of the Society’s Steering Group and by June Fraser ARCA PPCSD, a former Chairman of the Society, the book is concerned with making environments accessible to everyone and addresses the concept of ‘inclusive signage’. Providing clear guidance on producing signs and other wayfinding information, it will not only assist UK users to comply with the Equality Act 2010, but will be of benefit to other readers in giving guidance on best practice. 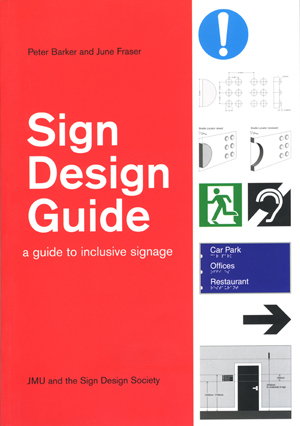 Essential reading for architects, designers, wayfinding managers, access officers and sign manufacturers, the Sign Design Guide addresses many information formats – visual, embossed, braille, audible and other wayfinding devices for people with reduced ability. [If you’re a Sign Design Society member, you are eligible to buy the Guide at a reduced (£19.50 + P&P) price point]. *Please Note: Postage within and outside the UK will incur an additional charge. Please email enquiries@signdesignsociety.co.uk for further details.